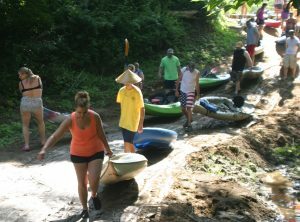 For one weekend out of the year the small town of Tornado, West Virginia, doesn’t seem so small when over 1,000 kayakers participate in the 12-mile Coal River Float event, the Tour De Coal. This year the event is expected to be even bigger, as the Tour De Coal will now be held in conjunction with St. Alban’s Yak Fest River Celebration. The inaugural Yak Fest will be a two-day river-based festival offering numerous entertainments that will give land dwellers an opportunity to join in on the fun. “We are excited about the entertainment venue our Organizational Committee has put together. It provides two days of exciting bands and groups who will sing and play music which will entertain everybody,” says St. Alban’s Mayor, Scott James. The schedule of events is stacked with art shows, an endless line-up of live music, and a BBQ. Between events, you can check out exhibitions and vendors showing off the latest in kayak angler fishing craft, fishing lures, and tackle and guided fishing and kayaking excursions. Craft beer and food are a given. There will be plenty for the kiddos to enjoy such as face painting and fun rides. The crown jewel of the event, the Tour De Coal, will be held on Saturday. 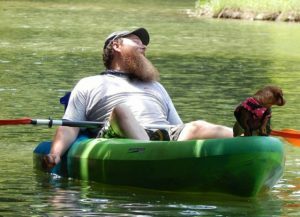 Furry floater, Mike Coger, and his canine friend. “The Tour De Coal is a Hoot!” says Bill Currey, co-founder of the annual event. He’s right; the event boasts to be the largest flatwater kayak event in West Virginia. 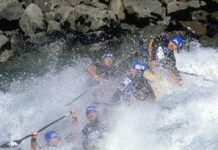 “Bill Queen, the Co-founder of the event and the non-profit Coal River Group, would never have dreamed that the simple float trip we created would bring so many people from so many parts of the U.S. to the small County Park located on the beautiful Upper Falls structure of the Coal Rivers,” says Currey. 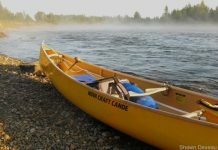 As per usual the paddle will start at 9 am on Saturday with a short presentation by Currey delivered from a park jungle gym overlooking the 1,000 eager kayakers and canoers. The presentation will initiate the ‘LAUNCH’, prompting participants to drag their boats down a long narrow path towards a team of volunteers and Tornado Volunteer Fire Department personnel, who will help the boaters into the water. Once en route downstream, paddlers will experience the natural beauty of the area and the general vitality of the town’s locals as the banks of the river are sure to host cheerleaders, barbequers, and loud music. The success of the Tour De Coal does not come without hardwork and diligent planning. In the weeks leading up to the event, a team of over 60 volunteers will be staging boat launches, advertising around town, and contacting an additional 70 public response personnel such as police, safety responders, and river-based law enforcement officers from WVDNR and US Coast guard. The local Coal River Group has helped establish the St. Alban area as the ‘Flatwater Capital of West Virginia’, and the Yak Fest is a celebration of that achievement. Whether you’re a river rat, live music enthusiast, or a craft beer junkie, the Yak Fest has something for everyone to enjoy.